Your Online Resource for NUMEROLOGY Certification! By completing this course, you will also have lifetime support from Steve G. Jones and NumerologyUniversity.org. Cancellation policy: Cancellations are allowed within 60 days of purchase. Instructor: Steve G. Jones, Master Numerologist, Board of Directors Member: American Lung Association (LA Chapter), Member: American Board of Hypnotherapy, Member: National Guild of Hypnotists · Founder: American Alliance of Hypnotists. Text Books (E-Book format): As part of the course (included in the total price of this course), you will receive a 4 ebooks by Steve G . Jones, M.Ed, Master Numerologist. This course IS for everyone. Even if you are a layman with no background in Numerology, or don't want to be a professional Numerologist, you should still take this course. You will learn how to accurately learn about your life through numbers. You will also learn how to use Numerology to help your friends and family! And, if you are a professional, this course will take you to the next level! Steve shares his powerful marketing strategies and teaches you how to make money as a full-time Numerologist! 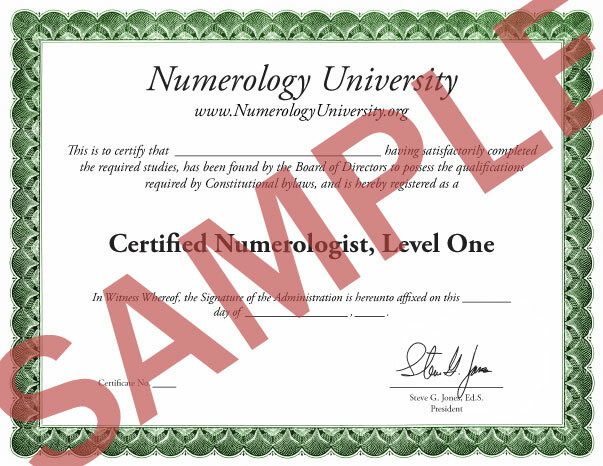 Upon completion of your training, you will be certified by NumerologyUniversity.org to practice Numerology. Q: Will I need any other training in order to practice Numerology besides your course? Q: Will I be properly trained if all I take is your online Numerology certification program? A: Ideally Numerologist would be trained in a classroom setting with an instructor physically present. Unfortunately, this luxury is not practical for many people. When we factor in airfare, hotel, time away from work and family, etc. the costs both monetary and otherwise quickly add up. For this reason, many institutions have turned to online training as a viable alternative to meeting modern day needs. In fact, Columbia, Harvard, and Cornell have extensive online programs. Also, Penn, Dartmouth, and Yale offer online classes. Steve G. Jones, while working on his doctorate in education, extensively studied the online programs offered by Ivy League schools. He then was able to model the Numerology training program to offer a similar level of training. Additionally, in this course, you are encouraged to find a study partner and to practice your techniques on a number of people. Q: What about licensing requirements for Numerologists. Are there any? A: At this time, to the best of our knowledge, there are no licensing requirements for Numerologists anywhere in the World. However, if you start a business, you will generally need a business license. Q: What Do I get When I Buy the Numerology Course? A: You get instant access to every module, which you can watch online or download to your computer. You also get instant access to Steve's electronic manual. A: It takes about 11 months if you move quickly by reading the training manual and watching the videos daily. You will however, develop a basic skill set to begin practicing within the first 2 months. A: Upon completion of this program, you will receive a beautiful certificate via email, which you can print and proudly display for your clients to see. It will have your name, title (Certified Numerologist), and your certification number. A: The program is taught online by Steve G. Jones. Q: What are Steve G. Jones’s qualifications as an instructor? A: Steve G. Jones has over 20 years experience as a Master Numerologist and certified clinical hypnotist, both teaching hypnosis students and working with clients. His list of former clients includes: Danny Bonaduce, Jeraldine Saunders (creator of the Love Boat TV series), Tom Mankiewicz (writer of Superman the movie), and many other celebrities. Steve has served on the board of directors of the American Lung Association in Los Angeles, California. He is a member of the National Guild of Hypnotists, National Board of Certified Clinical Hypnotists, founder of the American Alliance of Hypnotists, member of the International Registry of Clinical Hypnotists, has presented his hypnosis research at the American Council of Hypnotists Examiners, received the President’s appreciation award for his outstanding contributions to the American Association for Adult and Continuing Education, is a member of the American Board of Hypnosis, member of Who’s Who among Students in American Universities and Colleges, member of Pi Lambda Theta International Honor Society and Professional Association in Education, member of Omicron Delta Kappa Honor Society, member of the Golden Key Honor Society, recipient of the National Leadership Award from the United States National Congressional Committee, received a bachelor’s degree in psychology from the University of Florida, received a master’s degree in education from Armstrong Atlantic and State University, received the educational specialist degree from Georgia Southern University, and is currently a doctoral candidate in education at Georgia Southern University. Steve has recently been featured on TruTV, CNN, and is under a development contract for his new television series on hypnosis. Q: Do I need an advanced degree to practice Numerology, such as a bachelor’s degree or a master’s degree? Q: Does NumerologyUniversity.org help its trainees by promoting them online? A: Yes. You will be listed on the international online list of Certified Numerologist. Q: I am a layman with no Numerology background. Will this program actually take me from the ground floor up and teach me everything I need? A: Yes. This program is extremely thorough and it will teach you everything you need to know to be a certified Numerologist and help you run your own practice. Upon registering, you will have access to all of the modules. You can work at your own pace. You will perform the practical homework and e-mail back the entire program when completed for grading. What is Numerology and how does it benefit you? This home based course, is designed to be a resource for you for the rest of your life, to teach you what Numerology is and how to effectively use it. You will learn valuable tools for using Numerology as well as unique tools for life in this intensive, power-packed course. With the online training program you can study at your own pace and you are not tied to a specific training schedule. If Numerology enables rapid change, why not learn rapidly? Have fun, expand your awareness, and experience deep change. Understand the biggest challenges that you will come across in your life so you can prepare to shatter them as if they never existed! Gain a telescopic view of future events in your life related to things like your relationships, health, career and finances starting today! Have a picture-perfect view of what's in store for you from this point on so you can avoid risky situations and capitalize on opportunities! Have the peace of mind of not having to worry about was going to happen next in your life! Determine how to reduce your stress and increase your energy! Cultivate deep, meaningful relationships that will nurture your soul! Know without a shadow of a doubt will be the right person for you to marry and when you should do so! See the writing on the wall when it comes to your personality and characteristics so you never again have to question who you really are or what you're meant to do! Take your career to the next level by knowing when to strategically make moves! Ignite the passion within so you can finally discover your life purpose and live your dreams! Numerology, Psychology, Number Meanings, Name Analysis, Core Number Analysis, Birthday Analysis, Life Path Analysis One, Expression And Soul Urge Numbers, Double Numbers, First Name Analysis, Number Based Distinctions, Number Energy, Past Life Impact, Maturity Number, Karmic Debts, Temperament Analysis, Strength/Weakness Isolation, Relationships, Self Analysis And Much More. ENROLL NOW FOR JUST ONE PAYMENT OF $47!